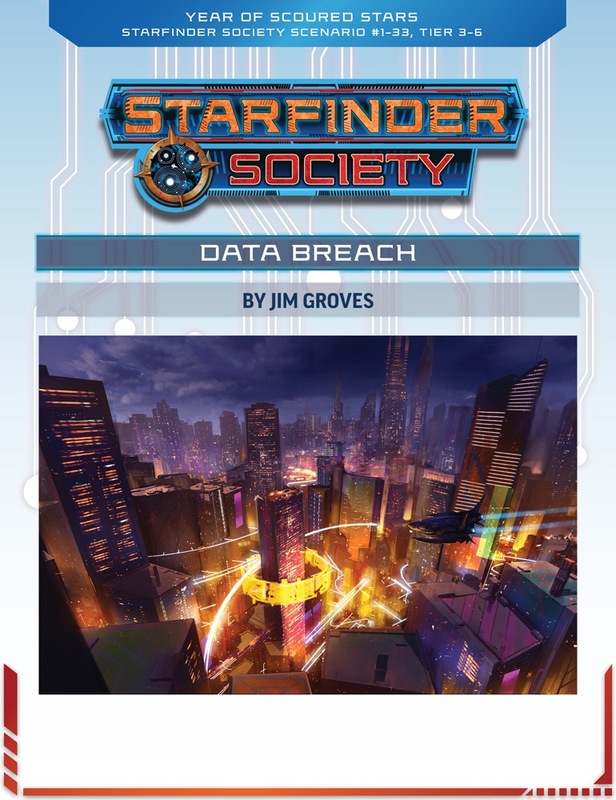 A Starfinder Society Scenario designed for levels 3-6. Following up on previous intelligence about a broad conspiracy against the Society, the PCs undertake a daring raid against a fortified complex near a city within the Pact Worlds. With only a limited amount of time to breach the site and retrieve valuable data before an automated system scrubs the files, the PCs need to use all their skills in order to complete this mission in a race against the clock. Content in Data Breach also contributes to the ongoing goals of the Dataphiles faction. Data Breach continues an ongoing storyline that began in #1-07: The Solar Sortie and continued in #1-14: Star Sugar Heartlove!!! I highly recommend playing those two scenarios before this one, although it’s not necessary. It’s also assumed that #1-99: The Scoured Stars Invasion has taken place, although that has little effect on this scenario for players. The events in this ongoing storyline are sure to continue on in future scenarios, including the upcoming #1-38: The Many Minds of Historia. It should be noted that Computer and Engineering skills are integral to this scenario, so players will want to select their characters wisely. It’s important to ensure your team has at least one tech-savvy character (preferably more than one!). If you don’t, slot one of the ‘Hireling Access’ boons. You’re gonna need it. Data Breach tasks players with breaking into a secure facility on Verces and obtaining all the information they can from the site. Although there’s good reason for this heist, I won’t get into the details of it here, as it involves mild spoilers from some previous scenarios. Rest assured: it’s important! Before heading off on their mission the Starfinders have a chance to question a prisoner being detained by the Stewards, potentially uncovering more information on the facility and its defences -- which was a really nice touch. Admittedly, computers and hacking aren’t my favourite parts of Starfinder. But, that said, I love a good heist. So I wasn’t sure how much I would enjoy this scenario. Turns out, I loved it! I really like the mission premise and its importance to the overarching events of this season. I like the complex itself, it’s set up, and it’s defences. The battles were complex and layered, particularly the final combat, which is going to be a really nice challenge. I really enjoyed that many of your actions as players can have consequences in this scenario (including past the end of the scenario), which aren’t always immediately obvious. It was nice subtlety. All in all, I think Data Breach is a great, guilt-free romp that a lot of players are going to enjoy. It's exceptionally well-executed. I give it four out of five stars. (Although, if you particularly enjoy computers, hacking, and intel-themed missions, consider it a five!). I'm going to call it right now, we're going to Blue Rise Towers, yes? One custom full-page map included with this scenario. NOTE: We'll be including a version of the map that includes smaller sized squares to provide smaller 5 ft. squares to handle the main map being 1 square = 10 ft. This is an experiment to see if it helps our GMs. I love this, @Thursty! Thanks!